Now the morning light does not brighten the shop wall until after 7 am. Chipmunks and birds get a Saturday sleep-in as I do not let the cat out until light on the weekend. Yes, we have had cool temperatures lately during the evenings and early morning. By the time I get home from work there is hardly time for a relaxing social drink and quick stroll around the garden. It's either pick snap peas and kale or stroll, sit and sip. Daytime temperatures are still overly warm. The big maples are losing leaves before they have much of a chance to turn other than yellow and then brown. Rhododendron also show drooping yellow leaves. The tropical downpour, after weeks of drought, brings welcome relief for the newer plantings, as well as bringing down the ash leaves now blanketing the beds.. 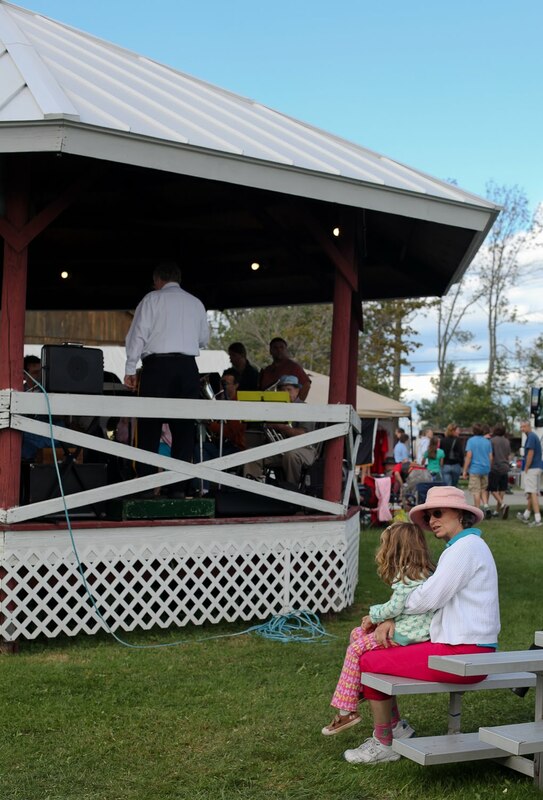 The cooler nighttime temperatures came just after the annual Goshen Fair. This benchmark end to summer gathers the fatted calves from near and far as well as dozen varieties of tomatoes and everything in between alongside the annual carnival. Thank goodness for grandchildren to show the wonder of the fair! The sparkle in their eyes is as loud as the squealing piglets. The timing of the fall garden seems much advanced this year, probably due to the drought. 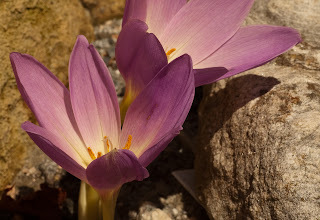 Colchicums, who usually wait until after the autumnal equinox, began opening in August. Unfortunately, many of my labels for them have not survived. The thought of keying them brings laughter as there is no current published authority. We shall wait. 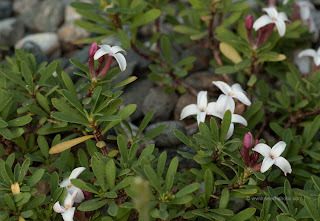 But until then, the flower is still as enjoyable whatever the name. Most interesting to me is how this C. sp. starts out with one or two flowers, with the slightest persuasion of purple. In fact, looking inward, it is clearly white all over the center. As the days of its performance lengthen and other blooms join, laxly rising from their bulbs, the purple intensifies and becomes checkered as if painted by Escher. In botanical speak this is tessalation: arranging small mosaics or tiling. My favorite example of this in the plant world has to be the spring bloomer Fritillaria meleagris. (Now is the time to plant for that display.) 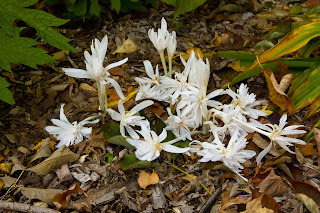 I had surmised this colchicum to be C. autumnale, but have found mention of no tessalation in literature. 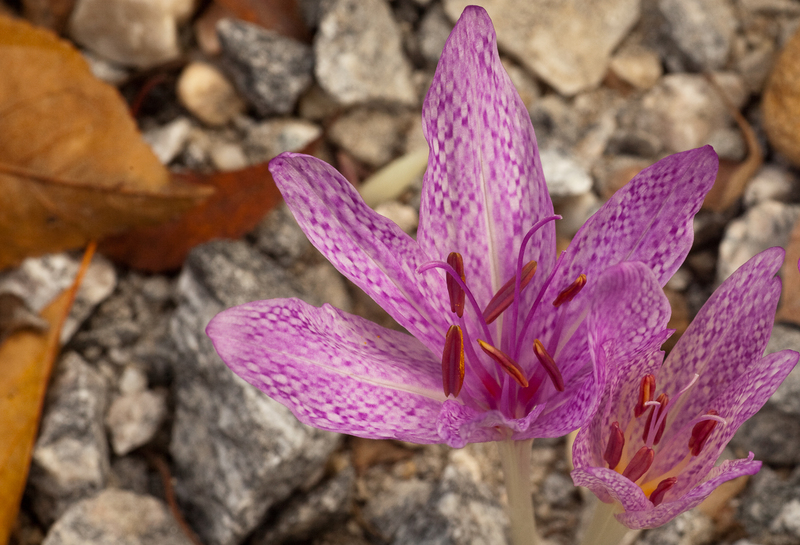 The first autumn bulb to be planted in this Goshen garden was the splendid Colchicum autumnale 'Alboplenum'. I knew it from my previous home where it had grown without fuss. 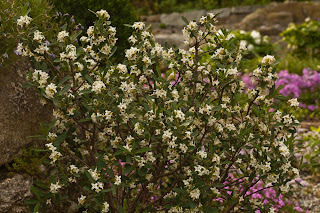 In the ground here for many years at the corner of the stone wall, it would open in early October, surviving the leaf fall and early frosts. When the new sax garden came along, I thought it had been paved over by stepping stones. After three years, now it's back! 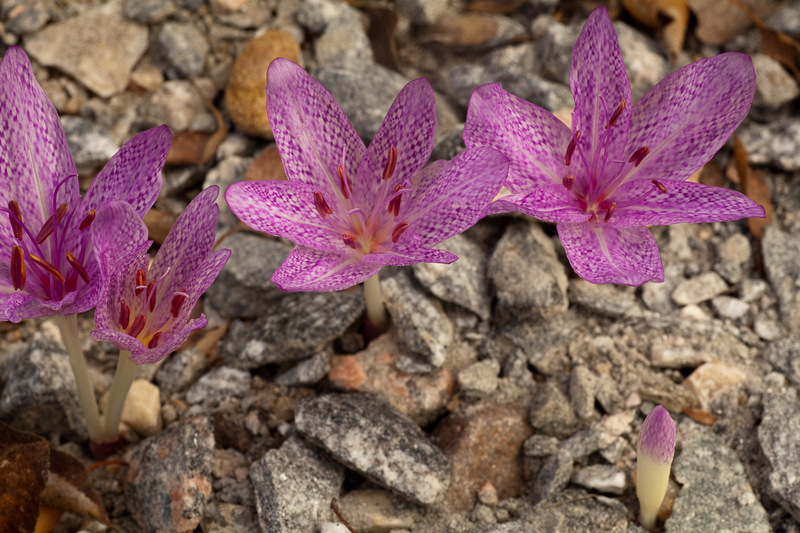 Recently we added a very lovely and large species, blooming September, named Colchicum speciosum. Holubec in his "The Caucasus and its Flowers" gives a distribution in the montane and subalpine meadows as well as streambanks of the mountains in Turkey and Iran. That should be a good clue as to where to plant. I make sure there is plenty of drainage. What is now in the trade reliably gives a good fall display in Goshen. What you see as it opens remains until the end of the show. As the opportunity presents itself, we try less hardy hybrids. Colchicum agrippinum may be a cross between C. variegatum and C. autumnale. In internet literature, it is supposedly easier to grow. 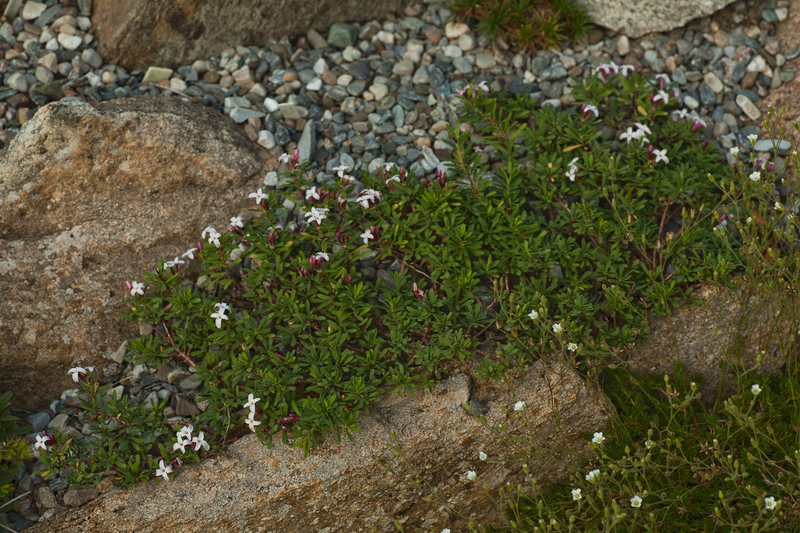 Here we positioned it at the base of the patio scree.The autumnale ancestry may add just enough hardiness to last here in the Berkshire foothills. And Escher would definitely flip over this one. 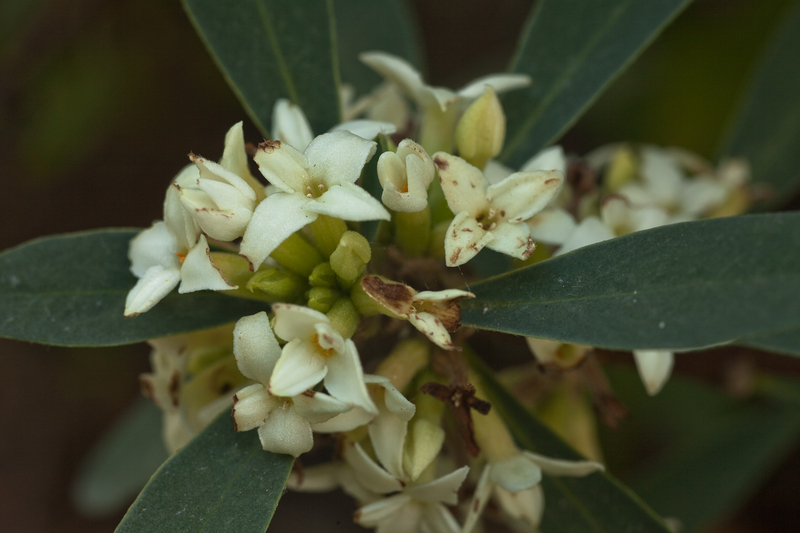 Whenever a visitor comes to my garden the fist question is always "Do you know Daphnes?". 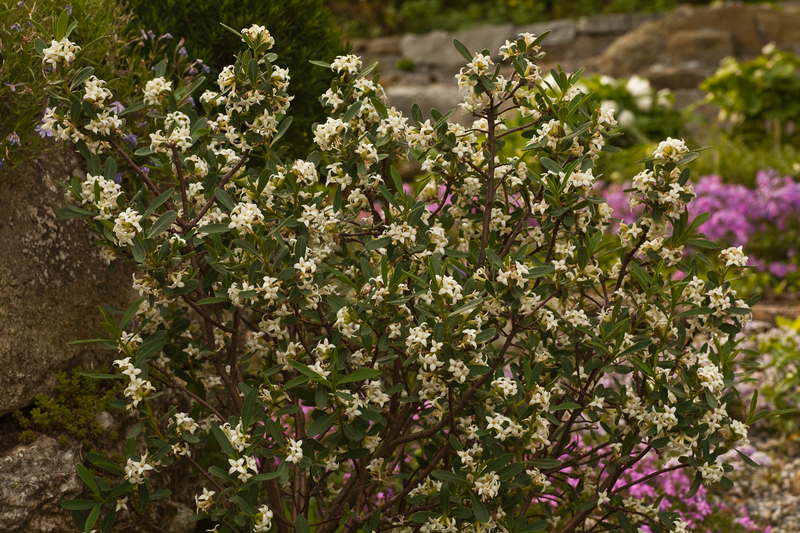 They are the mainstays of the rock garden shrubs. 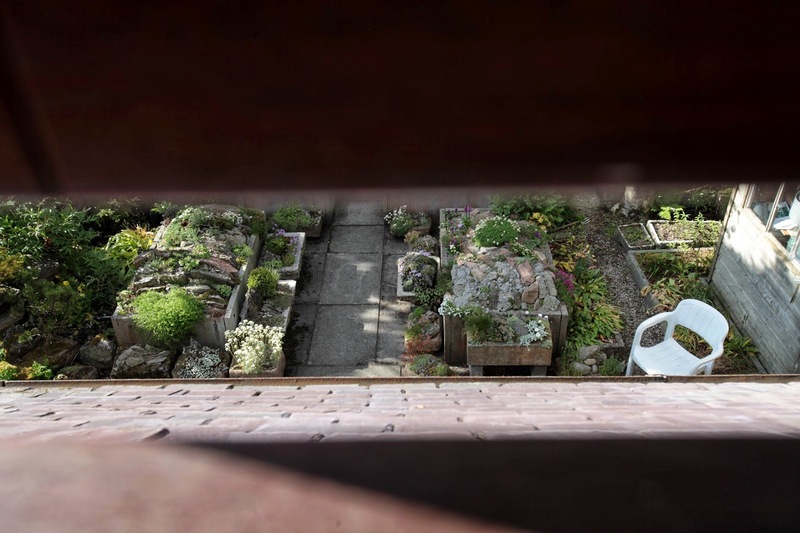 Varying in size, one can definitely explore much of the species with a large collection in a small garden. 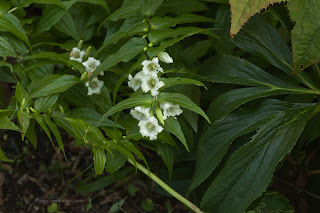 Many years ago I came home from a plant sale with one not labeled. It was inserted at the base of the raised lime bed. Lack of a label at that time did not daunt me. Recently, thanks to Barry Porteous' keying skills, we believe it to be Daphne alpina. The main trunk has swelled to a couple of inches, supporting its two foot height. 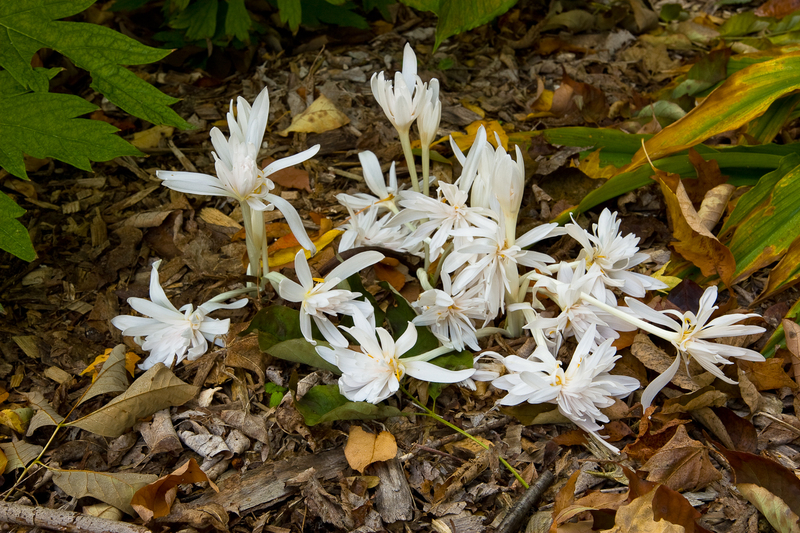 It gives a sweet spring display and then reblooms through the fall. Barrie also helped with identifying Daphne x whiteorum "Warnford".This prostrate cross grows up the slope and has a few blooms all season. At times the buds open very pink but always fade white with a plum backing. 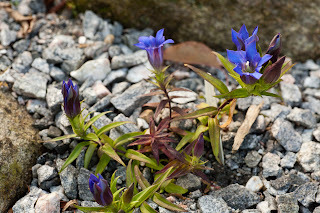 Gentians continue during this season. Gentiana asclepiadea is a rather tall floriferous late summer bloomer. 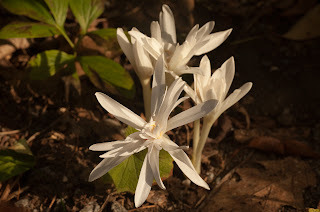 It peeks through the diphylleia, which shelters it Given its preferences, it will colonize and delight every summer. Easy from seed, there are many color forms, from blue to pink to white. It's sometimes nice to mix them for an added shimmer. Give it rich moist soil at the edge of the woodland and keep it out of the hot sun. Look for this must-have in the seed lists. The willowy gentian lasts until fall when it passes the "indispensable" torch to Gentiana scabra, a native of Japan. G. scabra has a few forms, some more upright than others. 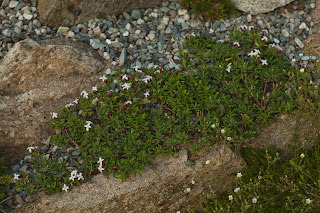 The one that works here is decumbant, lying in grit based with moist soil. 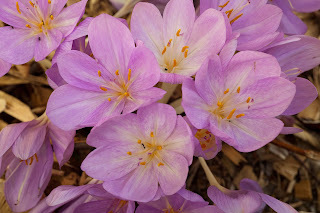 (When given the richer soil that it prefers, it does not seem as hardy during winter ice storms that come to this zone 5/4 garden.) 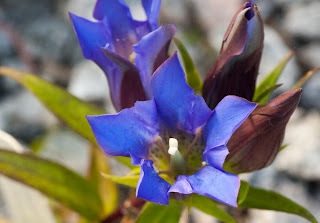 Even years when frost comes in September, there is good bloom and saturated gentian blue color later on in the fall. 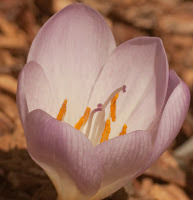 During the torrential rain of the past few days, it merely closed its buds and hunkered down. This morning, upon inspection, buds are intact and re-opening. Another very easy plant from seed, it blooms through October and sometimes early November.